In the language of flowers, Coreopsis means "always cheerful," and these delightful natives of the Americas live up to this designation in glorious fashion. Equally at home in naturalized prairie settings or manicured landscapes, Coreopsis provide a lovely sunny presence wherever they make their home. Although typically seen in colors of yellow and gold, many species also contain red, bronze and burgundy colors and have been commonly used as dyes in native fabrics. The flowers were also boiled into teas by the natives of North America before the introduction of coffee. In recognition of the importance of the genus, Florida and Mississippi have named Coreopsis as their state's wildflower. As many as 80 Coreopsis species can be found naturalized in the Americas with 38 listed in the lower forty-eight states. A member of the Asteraceae family, which covers a broad collection of daisy-like flowers commonly called composites, Coreopsis flowers are made up of two primary elements; the showy ray of colorful petals surrounding a typically bronze or brown center of disk flowers. Unlike its cousins in the Sunflower group (Helianthus, Heliopsis, and Helenium), botanists opted to name our cheerful floral friend with reference to the appearance of its seed rather than the beauty of its flowers. Hence the common name 'tickseed' which derives from the Greek 'koris' meaning bed-bug and 'opsis' meaning appearance and referring to the resemblance of the seed. Regardless of the less than endearing botanical designation, Coreopsis carries on with its "always cheerful" show of abundant, colorful flowers in the spring and summer garden! Coreopsis can be hardy to USDA zone 3 (C. verticillata, C. tripteris) and range into the extreme heat of Florida and the Southwestern states (C. floridana, C. tinctoria). Many of the species are self-seeding and considered annuals (C. tinctoria), however the most common perennial Coreopsis include Whorled tickseed (C. verticillata), Lobed tickseed (C. auriculata) and Large Flowered tickseed (C. grandiflora). 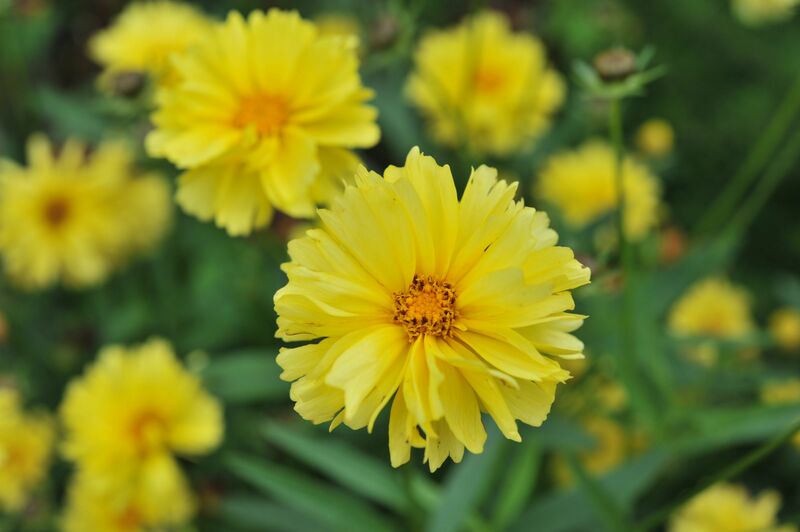 The variety 'Early Sunrise' (C. grandiflora) was designated an AAS Winner in 1989 and remains among the best selling Coreopsis for garden use. Other important varieties include 'Moonbeam,' 'Zagreb' (C. verticillata) and 'Nana' (C. auriculata). 'Sunkiss' (C. grandiflora), and the Big Bang, Hardy Jewel and UpTick series (C. x hybrida) are among the most significant new introductions. 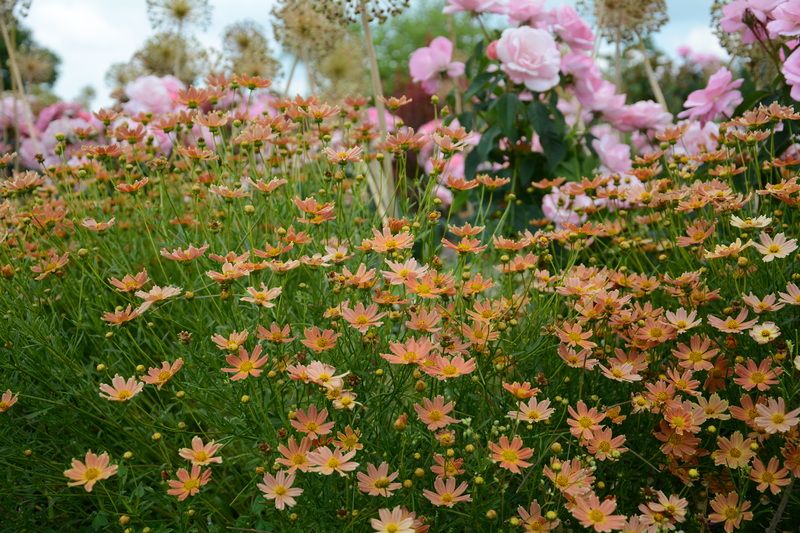 There are dozens of commercially available cultivars varying in height from 6" to 3' and covering a broad color range from the traditional yellow to caramel, bronze, red, gold, rose and cream-white. They can be incorporated into nearly any area of the garden where height and color are needed. Coreopsis commercially available in today's retail outlets prefer sunny locations with well-drained soils as these are typically derived from the northern and prairie species. C. verticillata varieties are known to expand their territory by underground rhizomes and should be renewed periodically unless the gardener wants them to take over the space allotted altogether. Coreopsis are considered long-day obligate plants which means they need a day length greater than 12 hours (typically 13–14 hours) to produce flowers. One notable exception is C. auriculata 'Nana' which flowers under shorter day length. Most cultivars will rebloom when old flowers are removed. This can be accomplished by removing individual spent flowers or by shearing the plant to 50% of its original flowering height. Reblooming will occur within a few weeks. Due to their abundance of flowers, Coreopsis is a pollinator magnet attracting bees and butterflies to their blossoms and birds to their seeds. They are also resistant to deer feeding and considered drought tolerant. 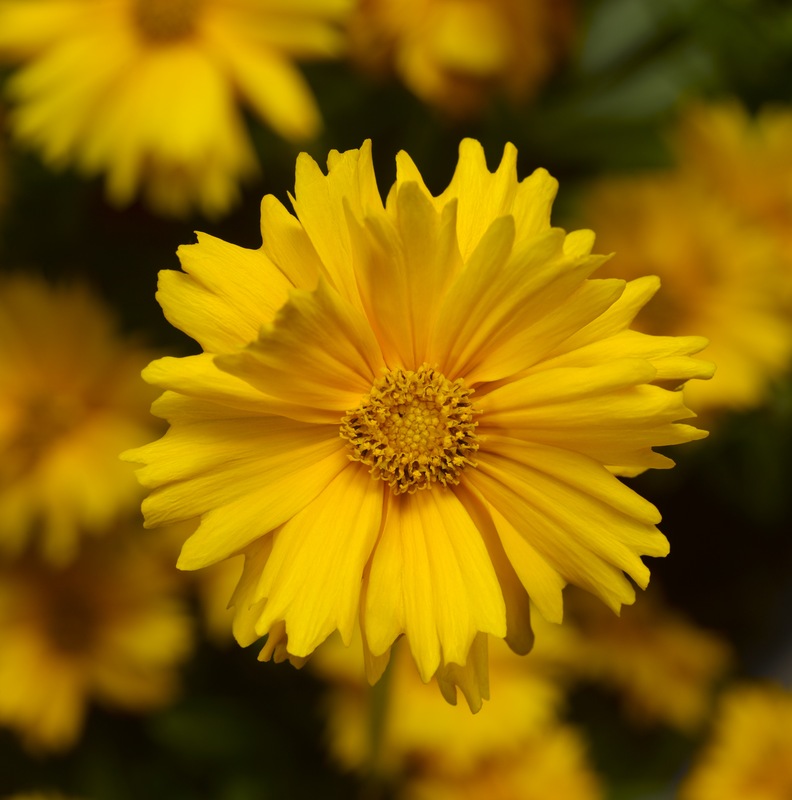 Coreopsis in the garden does benefit from fertilizing in the spring to encourage new growth. 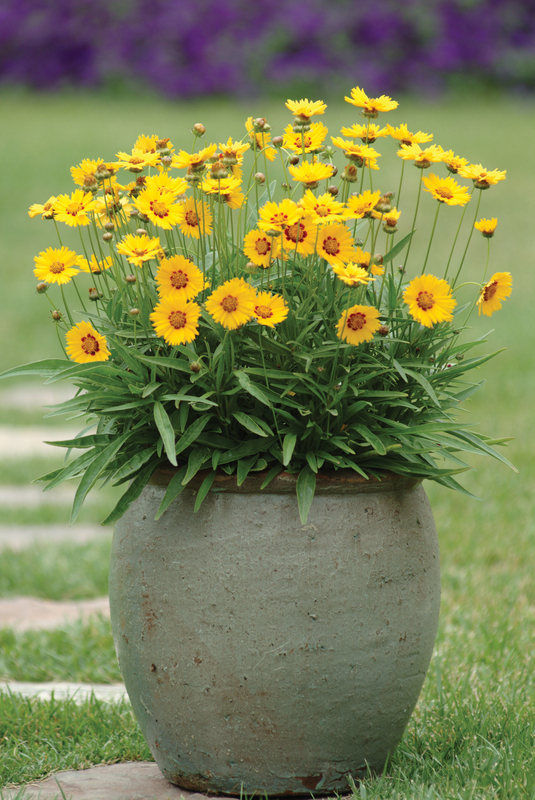 Although we believe Coreopsis to be a garden plant, they are equally at home in containers and will provide all the show and interest as a container plant. Consider varieties in the C. grandiflora and C. x hybrida group for container use. Given the beauty, resilience, and popularity of Coreopsis, it is entirely fitting that the National Garden Bureau has designated 2018 as the Year of the Coreopsis.